From the moment I booked my cruise on the Norwegian Gem, I’d heard nothing but good things about the line’s steakhouse, Cagney’s. So when it came time to book restaurants, the specialty restaurant was No. 1 on my list. Thanks to Norwegian’s well-known “freestyle cruising” policy, I was able to make a reservation so that I would be able to eat when I wanted to. When we arrived at Cagney’s, we were seated right away and given a bread basket with butter. The bread is warm and delicious, but save room… there’s a lot of food coming! When the server asked for our drink order, I chose the restaurant’s signature cocktail: a sidecar. It was very good, but since I prefer red wine with red meat, I switched to a glass of Merlot for my second drink. Nothing goes better with a steak than a glass of red wine! When Husband wanted to see the wine list before making his selection, he was given a digital wine list which had all sorts of filtering options to help figure out which would go best with your dinner. You could spend hours perusing the wine selections! Once chosen, it’s served in a giant glass. Because Cagney’s is a specialty restaurant, diners can either use one of the credits that came with their dining package (if they have one) or order items a la carte. Since we had the dining package, we were able to each pick an appetizer, a soup or salad, an entree, sides, and a dessert. The menu has prices on it for those ordering items a la carte… but those on the dining plan can just ignore the prices. We started with the lump crab cake and chilled colossal shrimp trio. The crab cake was very good and just about the right size we expected for an appetizer. The crab cake appetizer got our meal off to a good start. The shrimp trio was good, but I felt it was a little small for an $8 appetizer. I would never order it if I didn’t have the dining package. There were three shrimp as promised, but I would not call them “colossal.” They were pretty standard, shrimp cocktail-sized shrimp. The Jack Daniel’s cocktail sauce it came was also pretty standard, but that might be a good thing. Tasty? Sure. Colossal? Definitely not! For the soup-or-salad course, I opted for the lobster bisque and Husband went with the iceberg wedge salad. The wedge salad was not much different from any other steakhouse wedge salad, but it was very good. It did include scallions, which is unusual and a nice addition. Wedge salads are a steakhouse staple, and this one didn’t disappoint. On the other hand, the lobster bisque was disappointing. I like bisques to be thick and creamy, but the one served at Cagney’s was fairly thin. That said, the flavor was good and I still enjoyed it by sopping it up with our bread. The lobster bisque could have been thicker, but was still very tasty! Both of our entrees were outstanding. 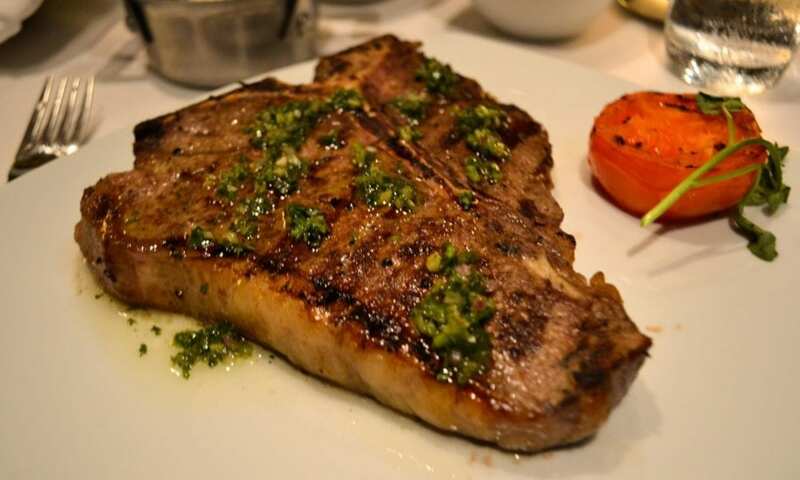 Husband ordered the massive 20-ounce porterhouse steak, which was cooked correctly to his medium-rare request and went really well with the chimichurri sauce (several different sauce options are offered). Being a steakhouse, it should come as no surprise that the porterhouse was beautifully cooked. The sides he selected were the truffle mashed potatoes and the mac & cheese. The mashed potatoes were surprisingly tasty… in fact, we could have eaten a whole second portion! The mac & cheese was weirdly spicy. I later sampled some mac & cheese from the buffet to compare and while it might not have actually been the same, I’d say it’s definitely not worth paying for Cagney’s version. Unlike the main course and most of the sides, the mac & cheese — which was oddly spicy — definitely was not a hit. I ordered the bone-in veal chop with mushroom sauce. There weren’t a lot of mushrooms in the sauce, so this mushroom lover was glad that, even without knowing that, I ordered the sautéed mushrooms as one of my sides! The bone-in veal chop was excellent, although the sauce was lacking. My other side was the Parmesan truffle fries — also know as Cagney fries — which were okay, but I wouldn’t order them again. I expected a good amount of flavor, but they were slightly-more-interesting not-that-well-cooked fries. The best part about them was the presentation, as they were served in a paper cone tucked within a metal stand. Many people rave about Cagney’s fries, but they weren’t all that. For dessert, we got the warm apple cardamom crisp as well as the raspberry creme brûlée. The creme brûlée was good but could have had more raspberry flavor. And I wish there had been more than one fresh raspberry on top. More raspberries (and raspberry flavor) would have made this a better dessert. The apple crisp was the perfect end to a delicious meal. The apples were tender without being mushy and the crisp was… well, crisp! Warm apple crisp was exactly as advertised… and a fantastic end to the meal. Irish Coffees were an even more-perfect end to the meal. We might have opted for cappuccinos, but had previously learned the hard way that while shots of liquor are included in the drink package, espresso shots are not! We did enjoy Cagney’s Irish coffees more than the same drink in the Grand Pacific dining room. Irish coffee is a nice way to top off a big dinner. So, I did the math. This meal would have cost $92 had I paid for it a la carte (not including the price of drinks). I would not return to Cagney’s for that price, but realistically, I would wind up ordering fewer items if I was paying for each one individually. Bottom line: Without the dining package, I would only go to Cagney’s if I was celebrating something. However, I will definitely return next time I do have the dining package; the food was great and the restaurant had a nice ambiance.